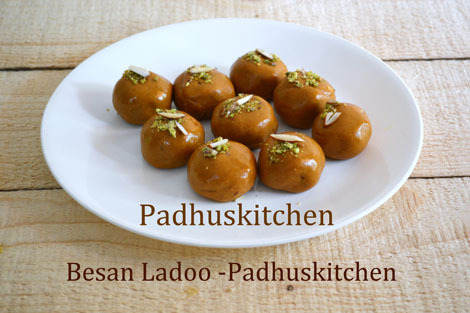 Besan Ladoo is a very popular Indian sweet prepared with bengal gram flour (besan), ghee and sugar. It is very delicious and also very easy to make. Today we will learn how to prepare Besan ka ladoo following our easy recipe. Powder sugar, chop nuts and keep it aside. Heat ghee in a pan, reduce the flame, add besan and sooji (or even semolina flour) gradually and stir continuously so that there are no lumps. Switch off and remove from heat. Keep stirring for 2-3 minutes after removing from heat. Keep aside and let it become warm. When it is warm, add sugar, almonds, cardamom powder, raisins and mix well. Divide the mixture into equal portions and shape into medium lemon sized balls. Decorate it with finely chopped pistachio and almonds. After it cools completely, store in an air tight container. This stays good for a week if handled properly. Note- Suppose if the mixture becomes too dry, making it difficult to make balls, do not panic, just add 1-2 tsp of warm ghee to the mixture and then make besan ladoo. If the mixture becomes too soft, you can refrigerate the mixture for 10-15 minutes and then make besan laddus. In that case, you can reduce the amount of ghee the next time you make laddus. In case if you are using besan sold for the purpose of making laddus, you can skip adding rava or sooji. Feel like finishing that whole plate, damn cute looking besan laddoos. A super delicious preparation. We made besan laddoos too last week at Boise.Came out quite well. Excellent and irresistible,makes me hungry..
Wow yummy ladoo !!! Looks so tasty and cute ones !!! Perfectly done. Loved the color and the garnish !! Great looking ladoos.. I was looking for this recipe.. Bookmarked this right away! Hi padhu im a little confused regarding rava exactly how n wen to add it...n one more thing pls tell me mothichur ladoo recipe also..pls..